A60 MINI-ITX case is set for a release date on January 1st. However, the mini A60 MINI-ITX case that features a unique compact design and can hold a Nvidia GTX 970 and GTX 1080 graphics card are now available for pre-order via Taiwanese online retailer Geeek store. The A60 MINI-ITX PC is now available for pre-order via Geeek store for $109 with ADT 180mm PCIe 16x Riser. The A60 is the model number of the MINI-ITX case. The case is available only in Matte Black color option and its made out of Acrylic, Aluminium Frame. On both sides, you get a transparent panel which can be easily removed. The Mini-ITX A60 aluminium frame measures 158x252x332mm (W x H x D) in Dimensions. For the connectivity, the case features X2 USB 3.0 port, 2 Expansion Slots, and space for X2 2.5-inches SSD/HDD. To keep the cabinet cool while you play hard on the PC, the A60 MINI-ITX case comes with x2 120mm Fan on top. The case supports CPU cooler up to 75mm height. 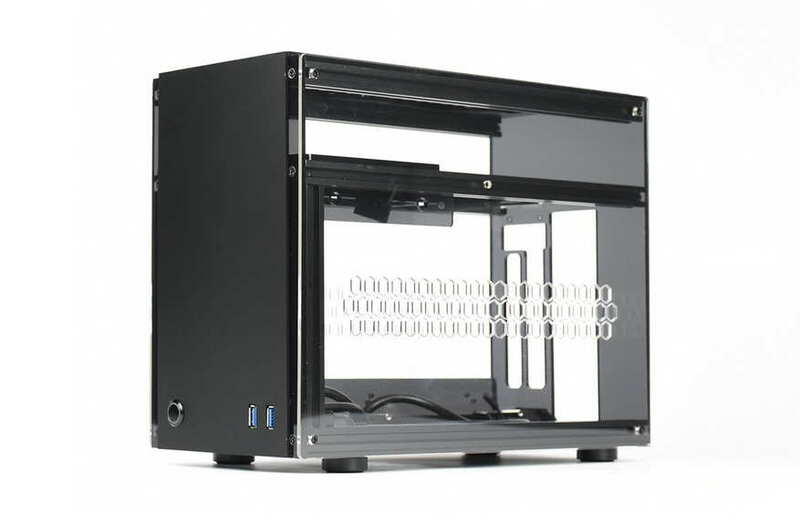 The A60 MINI-ITX case can hold Graphics card with length up to 300mm. You get the following in the box with your A60 MINI-ITX case. The company specializes in designing and producing clean and unique DIY “Acrylic” pc case for a long time. The new A60 MINI-ITX PC cabinet looks amazing and so clean and it can also hold all your PC peripherals. The A60 MINI-ITX case will be launched on January 1st, but if you want to pre-order, you can do it now.